Put banana and yogurt in a blender with peaches, orange juice and wheat germ. Add ice and blend until smooth. Garnish with peach or banana slices and sprinkle 2 tsp. wheat germ on top. Go a little crazy! Put 1 cup of yogurt, ½ cup of milk, and 2 cups of ice in a blender and add any fruit from your basket that’s getting a little too ripe. It’s hard to find a combo that doesn’t taste good together! 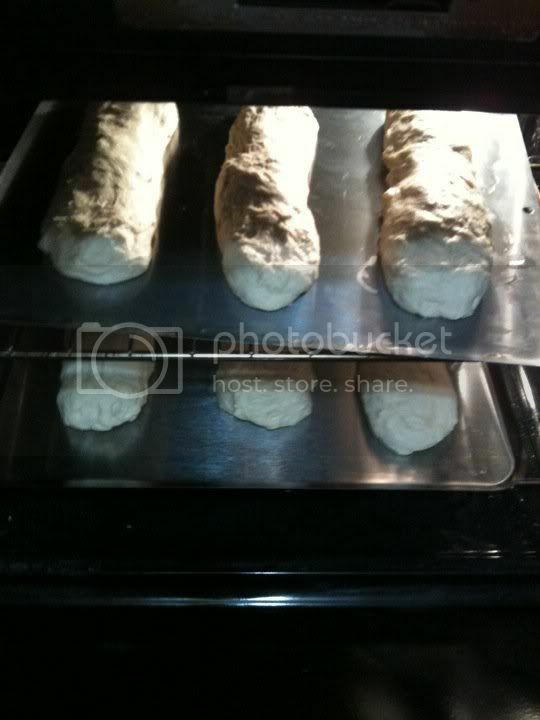 I love to make and freeze french bread pizzas for a quick dinner or lunch. Around here most food is made from scratch and these are no different, but while it may take awhile to make these they are worth it! First make your bread. I make an Italian loaf because I like it a bit better than French bread but if you have recipe you like you can use it in place of this recipe. I’ve recently had the chance to visit two very different dairy farms in my area. And thinking about the two farms has made me consider my views on agriculture and dairy cows. The first farm that I visited was Little Qualicum Cheeseworks. It’s a small farm that produces cheese on-site, using the milk from its own herd of cows. The cows spend most of their time outdoors, grazing in the pasture. Their diet is supplemented in the winter with hay and silage, during the time they can’t be outdoors. The farm has an SPCA certification that means its animals are well cared for. Jamie Oliver’s Food Revolution is a huge sensation. The TV program is airing in the US right now, and Jamie’s philosophy of cooking real food from fresh ingredients is hitting home. I live in Canada, but even here people are talking about what’s happening each week on the show. They’re trying out new recipes and re-considering their approach to what they feed their children. Knowing how to cook means you’ll be able to turn all sorts of fresh ingredients into meals when they’re in season, at their best, and cheapest! Families (or single folk) buy a “share” (or two if you’re a large family)- ranging in price from say $400.00 to $800.00+ and each week you meet at a pick up location for your box of vegetables and fruits. Most CSA shareholders pay in installments, some take advantage of work-share options, and all pay a down payment of some sort. And that’s in part the beauty of CSA– because buyers pay the farmer upfront she can estimate how much to plant. Here in the Pacific Northwest we have had an unusually mild winter and an early spring. Many of the plants in my garden that normally die off have not, including my parsley and celery, and now in late February they’re coming back with new growth. Flowers are blooming, buds are budding, and people are working outside in shirtsleeves. This sunny, warm weather has me thinking of spring and my garden. If you’ve been following my posts here at 5 Minutes for Going Green, you know I’m all about taking baby steps toward eco-living. In other words, I tend to take two steps forward, followed by at least one squarely on my cushy bottom. One step forward I’ve taken recently is to bake and cook healthy, whole-food after-school snacks for my kids. I’m tired of buying over-processed, heavily-packaged snack foods that destroyed my grocery budget. Fry the eggs individually (we cracked them right into circular cookie cutters on the griddle to keep their shape). The Dinner Co-Op: an Easy Way to be Green? A number of years ago, an acquaintance of mine belonged to a dinner co-op. The concept was simple: four friends (living on the same block) shared the burden of the evening meal. Each friend was assigned one day of the week (Monday through Friday) and on her assigned day, cooked dinner for all four families. The other three days, she sat back and waited for her family’s meal to be delivered. At the time, I thought it sounded like a convenient idea–even an ingenious idea–but I didn’t consider it to be necessarily a ‘green’ idea. I realize now I was wrong: dinner co-ops are a great way to be environmentally responsible while enjoying the awesome benefit of cooking only once or twice a week. My grocery buying habits have shifted over the years. Once upon a time (in a long forgotten age) I was a single university student living alone. Most of the food I bought came in small packages. In the first place, there just wasn’t much cupboard space in my tiny apartment. In the second place, there was no way I could get through the economy sized tub of mayonnaise before it spoiled. But then I got married and had one baby, and another. And suddenly we were going through food at an alarming rate. These days I do opt for the economy sized mayonnaise , because we will eat it and it’s, you know, economical. It is no secret that I love food. Local, slow, whole, delicious food. It should be no surprise then that I simply could not resist the opportunity to spread the word that the fifth annual Eat Local Challenge is underway. I don’t recall a fundamental shift in perception ever having taken place. Rather, it was a slow and steady evolution that led us to curb our long-distance consumption at the dinner table. It wasn’t a conscious decision made, but it did turn out most convenient and achievable that way. I imagine much in the same ways that it would be most achievable for other families to go about it in the same way; slowly integrating local when and where it’s most possible.